Access Artists' Signatures from anywhere in the world! 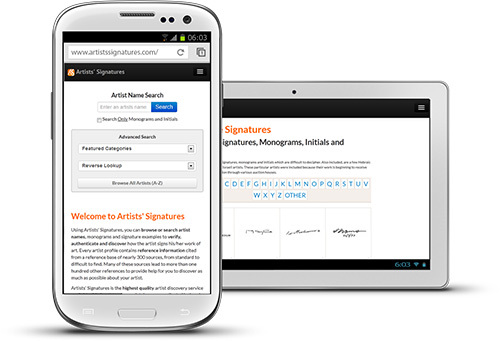 The Artists' Signatures Discovery EngineSM was designed from the ground up to help searchers easily determine the identity of artists with illegible or difficult to read signatures by enabling you to search based on the way the signature appears on a work of art. Every illegible signature, monogram, and symbol in our comprehensive database of over 100,000 examples was manually reviewed by our team to ensure that each signature can be identified by our users based on the mark's appearance alone. Every artist profile contains biographical reference information including, birth and death dates (if available) from hundreds of reputable sources. Artists' Signatures is an online service providing fast and easy access to a comprehensive database of fine art research information and hand-copied signature examples. Artists' Signatures incorporates the contents of all 17 of John Castagno's books as well as additional corrections and unprinted research. Most importantly, Artists' Signatures makes it possible to discover an artist's identity when the only information available is an indiscernible or monogrammed signature. The ArtistsSignatures.com web site is designed/managed by Digital Creative, a Web Design Company in Philadelphia, PA.
JOHN CASTAGNO, born in Philadelphia, PA, 1930. John Castagno has been an art researcher for the past twenty eight years and is also a multimedia artist and sculptor. He received his art education at the Fleisher Memorial, the Philadelphia College of Art, the Pennsylvania Academy of Fine Arts, and the Barnes Foundation in Merion, PA.
Artists As Illustrators: An International Directory with Signatures and Monograms, 1800-Present; Published 1989. American Artists: Signatures and Monograms, 1800-1989; published 1990. European Artists: Signatures and Monograms, 1800-1990; published, 1990. Artists' Monograms & Indiscernable Signatures: An International Directory: 1800-1991, published, 1991. Old Masters: Signatures and Monograms, 1400-mid 19th Century, published 1995. Latin American Artists: Colonial Era to 1996, Signatures and Monograms, Biographical/Bibliographical and exhibition information, etc. Published 1996. American Artists: Signatures and Monograms, Vol. II 1800-2005 published, 2005. European Artists: Signatures and Monograms, Vol. II 1800-2005 published, 2005. Artists' Monograms and Indiscernible Signatures: An International Directory, Vol. II, 1800-2005, Published 2005. Abstract Artists: Signatures and Monograms, An International Directory, 20th Century-2005, Published 2005. 1975 La Salle College, Philadelphia. First Sculpture Prize, Upper Merion Cultural Center, PA, 1972. Honorable Mention, Philadelphia Automobile Club, 1970. Honorable Mention, Delaware County Arts Festival, PA, 1970. First Prize, Delaware County Arts Festival, PA, 1969. Journal Star, Peoria: February, 23, 1972, Bl. & Wh. reproduction & photograph of John Castagno. Active News, Philadelphia: October 26, 1973 Bl. & Wh. reproduction & photograph of John Castagno. Concentrics, Evanston Art Center, Newsletter: October 1972 Bl. & Wh. reproduction & photograph of John Castagno. Since 1972: Annual Donator of art works to museums and public institutions; also securing many other benefactors. 1980: Sending direct relief to earth quake victims in a southern Italian town. Since 1985: Several awards for city greening; still on-going.